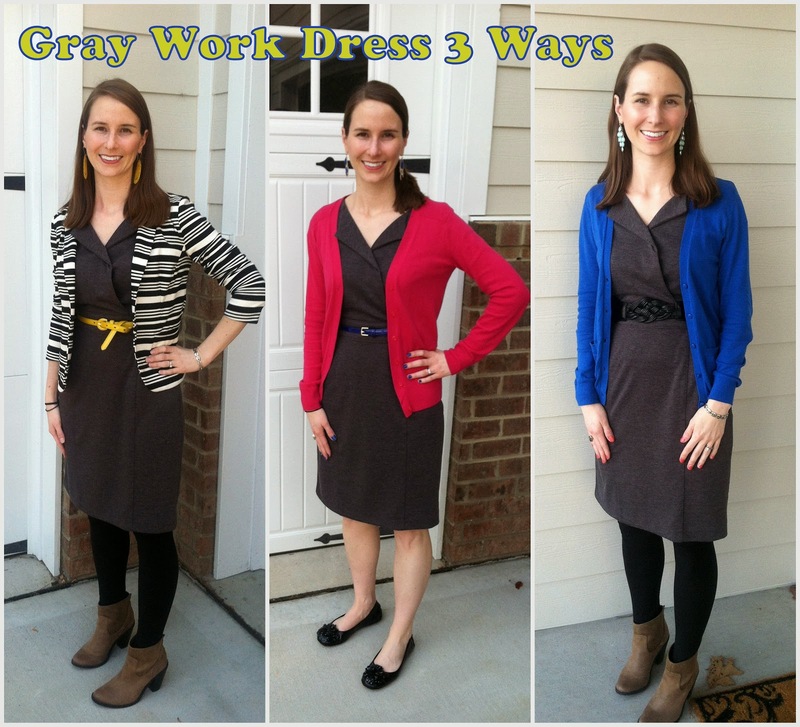 I picked up this gray work dress on sale at The Limited a few years ago. It's pretty plain and can look a little blah unless you dress it up so I like playing around with different blazers/cardigans and belts and jewelry. A gray dress is a wonderful work staple, especially this charcoal gray dress and is a little bit different than the usual black. I like that I can pair black with it without looking like I'm wearing too much black. Since this dress has an open v-neck, it doesn't look great paired with crew-neck cardigan but if you found a round neck gray dress then you could pair it with crew-neck or v-neck cardigans. Basil is by far my favorite herb. It smells amazing and tastes wonderful in many dishes... what more do you need? Dried basil never seems to be a very good substitute. I haven't done a full garden at our new home yet but I can't pass up growing a few things in pots and one of those is basil! It's so much more affordable when you keep a plant yourself rather than buying it every time you need it at the grocery store and plus then it's always on hand to enhance a dish. Just 2 days after I bought my basil plant, I decided caprese salad would be perfect to make and would use a good amount of basil. By picking a lot it will stimulate new growth. Plus caprese salad is refreshing and delicious! In a small pot, bring balsamic vinegar to boil over medium low heat and let the vinegar reduce for 10-15 minutes until thickened. Let cool. Cut 16 slices of roma tomatoes or 8 slices of regular tomato and 8 slices of mozzarella. Arrange tomatoes, mozzarella and basil in a dish. I decided to use a pie dish and it fit perfectly! When ready to serve drizzle with olive oil and balsamic vinegar reduction. 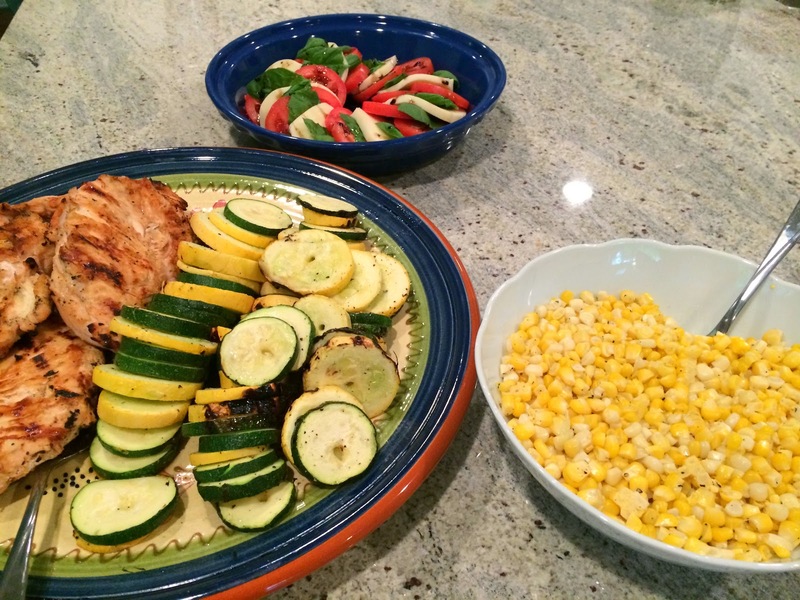 This dish was served with grilled chicken and veggies. I will share our new grilled chicken marinade recipe soon. I loved finding a new use for my fun blue pie dish from HomeGoods. Can't wait to make this again and again this summer! 4 years ago I started this blog (actually yesterday 4 years ago to the day!) to write about projects, recipes and adventures we have and a little about myself too. 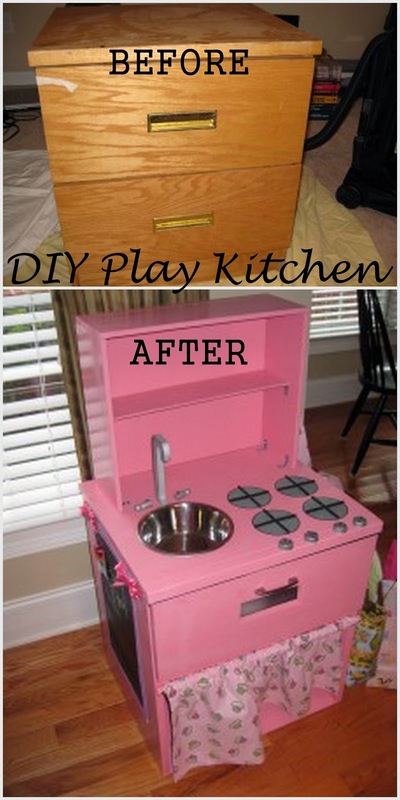 My first blogged project was the DIY Play Kitchen made out of a thrifted nightstand for our niece's 3rd birthday. It was also my the first furniture redo. It is still probably my favorite project and is one of the most visited posts for good reason. A few weeks ago Eric's parents said that our niece had outgrown the play kitchen and did we want them to sell it at their garage sale or did we want it back. (Side note... I cannot believe she is turning 7 next week!!) YES YES we wanted it back! With all the sweat and love that went into that project I couldn't let it be sold at the garage sale. Eric picked it up and now it's in our "game room" but will probably go in the storage/attic soon. I have to say that for after experiencing 4 years of non-gentle play from our niece and countless friends of hers, it held up well! I'm sure something similar in plastic would not be in the same state. You can tell this kitchen was loved and enjoyed but it just needs a little paint, a new "faucet" and some dowel fixing for the stove burners to be good as new. I am sure that there will be a little girl in the family or a very close friend that will enjoy this kitchen too and it can be passed on more times. It's basically like a family heirloom now :) Although I wouldn't mind making another one since it's just so cute and fun or even a boy or gender neutral version. Read the step by step process to make a play kitchen of your own for a kid to enjoy! Thanks to everyone who has been following along with this little blog of mine! This is what I wore to The Nester Book Signing several weeks ago. I am really loving my mint jeans! I'm finding more and more ways to create outfits with them. And I'm excited to report that my post about mint outfits convinced one of Eric's aunts to buy mint pants! As you can see I'm wearing a really plain white crew neck tee but it's easy to dress it up with colored jeans and a statement necklace. I showed you my awesome Tom Bihn Aeronaut bag and I showed you the 15 clothing items I mixed and matched into 15 outfits so all that's left is to show you how I packed everything I needed for a two week Europe trip into a carry-on (plus a tote) including sharing my actual packing list with you! I promise it's not as hard as it sounds especially when you think about how many times you come home from a trip with a big suitcase and you didn't even need half of what you brought. Am I right? This trip was in the early summer but the weather was chillier and more like spring weather so if your trip is in the summer you would have a little less to pack. If you are travelling somewhere civilized then do not try to pack every little thing you could possibly ever need. They have stores and pharmacies too so if you end up needing itch cream or more granola bars or you break your sunglasses, I promise you will not be out of luck. It was really awesome being able to travel with just my carry-on on my back and my tote on my shoulder... hands free travel! I searched on other blogs and such for a 2 week packing list for a carry-on and didn't come up with much so hopefully this will help someone else looking to be light packer. First let's start with the tote. I took a fabric tote made by my godmother that was lightweight but would fit the things I would want while on the plane or trains so I wouldn't ever need to access my carry-on bag. You could also use a large purse. As you can see the bag isn't full which was great if I wanted to take off a jacket or sweater if the plane/train was warm and stick it in my bag. This was the little zip up pouch I used as my wallet. It was the perfect size for some cards and cash and didn't contain any of those extra cards I wouldn't need like gift cards and discount cards I keep in my bigger regular wallet. You might remember my awesome Aubergine Aeronaut bag as my carry-on "suitcase". I put almost all the clothing items into plastic bags from target because it kept them nice and separated and I've heard plastic causes friction and keeps clothes from not wrinkling quite as much. But as a word of advice... don't pack clothes that wrinkle a lot. As you can see everything fit very nicely. If you are wondering about why I didn't pack more undergarments or pjs, I did wash these things out during the trip. The apartments we rented had washers and dryers but undergarments especially are very easy to wash in a sink and dry overnight. If you didn't want to do that, there would have been room for more of this in my carry-on but I just did not want to pack or carry anything extra. You may be thinking.. what about souvenirs? Well our main "souvenirs" are the photos we take and the memories of the trip however, I did bring home a doll for our niece and a couple small crystal glass souvenirs (plate and wine stopper) in my tote bag and carry-on with no problem. We did purchase some bigger crystal glass items that would not have fit in my or my husband's carry-on (he also only took a carry-on suitcase and messenger bag on the trip but we have since bought him his own Aeronaut) but we wouldn't have wanted to haul those around anyway so we shipped them home. I hope this helps you pack everything you need for a 2 week trip in a carry-on! If you would like to read about our 2 week Europe trip to Munich, Salzburg, Vienna and Prague go here. Happy to answer any questions so ask away in the comments! The first weekend in May, The Nester (Myquillyn Smith) of The Nesting Place blog had her book signing in Cornelius (suburb north of Charlotte) Saturday morning. I brought my mom with me. It was held at a super cute gift shop, Bebe Gallini's. This was the 2nd book signing I've been to in Charlotte. The first was Young House Love last year but this book signing was the complete opposite of that one. Everyone mingled, shopped and sipped on mimosas. It was very casual. We talked with Nester's dad and her sister. There was live music and snacks. There was no official line for the book signing. I sat down with Nester in the set up that looked just like the cover of the book and we chatted awhile. She is so sweet and down to earth. In addition to signing my copy of the book, The Nesting Place, she asked that I sign her copy of the book. How awesome is that?! We were able to listen to Nester read a few pages from her book to everyone too. She mentioned being nervous about this but she did a wonderful job. The tag line of the book is "It doesn't have to be perfect to be beautiful". The perfectionist in me can definitely learn to think of that phrase more often. This isn't your typical decorating book but it is about embracing reality when decorating and creating spaces for real people to enjoy. I can't wait to dig into the book more! It even won a spot on the Amazon best seller list. What an amazing accomplishment for The Nester! Check out her blog here. About a month ago, on a Friday night the first baseball game was in the new uptown ballpark for the Charlotte Knights. We had wanted to go to the game but it sold out too quickly. We decided to still hang out in uptown that night for the festivities as the city was alive with excitement over the first game and a nice breezy spring evening. We met up with friends, had some drinks and made our way over to the ballpark area where there were a few food trucks and hung out in the park. Later we went to another bar to round out the night. Below is what I wore. Since it was a bit breezy and got a little bit cool later that night I was thankful for the light long-sleeved top (and I carried a really lightweight gray jacket). At the end of April we spent the weekend in State College, PA for the wedding of our friend Will who went to high school with Eric. This was my first time in Pennsylvania. We left Charlotte late Friday morning and flew into Harrisburg. We met up with Keith and Megan, grabbed our rental car and drove the 1 hr 45 min to State College with a stop on the way for lunch at Panera. Let me tell ya, the food options in or near the Harrisburg airport are extremely limited. The whole area and the drive to State College was definitely more deserted than I expected. After arriving in State College, checking in at the Marriott and opening up our Penn State colored gift bag, we met up with some other friends in the lobby bar for awhile. Little Felix was there crawling about which made for great entertainment. A few from the group including Felix left for the rehearsal dinner and the rest of us headed into downtown State College, less than 5 minutes away. We decided on dinner at Spats Cafe & Speakeasy based on a recommendation from Ross and Susan's cab driver who was also a student. The food was delicious and there was a ton of variety on the menu. Many of the items were Cajun inspired and Eric's jambalaya (which I had a bite or two of) was yummy. I had an almond crusted chicken with a honey glaze and it was moist, a little sweet and really good. The brie appetizer was delicious but honestly how can you go wrong with anything brie? Right after dinner it started to rain so we went back to the hotel to hang out instead of staying in downtown. Saturday Eric and I were up and ready to really see Penn State. Carla and Felix came along too. We started by exploring some shops downtown. There was the cutest little kitchen and gift shop. Then we headed over to walk through the campus. I really love walking around college campuses and college towns. This was a pretty spread out campus with many more buildings than Clemson. There were so many greenhouses. And also a ton of laboratory buildings. Later Chris met up with us and we walked far to the other side of campus to see the football stadium. I was thinking there would be a neat Lion statue or sign or something but there really wasn't much to photograph and you couldn't see inside at least from the side closest to the campus and we didn't have time to walk around the whole thing. That was disappointing as I had really wanted to see the inside of the stadium and it's so easy to see that when you are in Clemson. We hopped on a campus bus so we could get back to the main campus area quicker. It was interesting that the campus bus was not free. May be it is for the students but not for visitors, like in Clemson where the campus bus is free for everyone. A few people that passed by gave Eric and Chris and Felix in the stroller very long glances (one guy in particular)... Carla and I were cracking up walking fairly far behind them. We walked back to the downtown restaurants and shops to have lunch at The Corner Room. There were sandwiches, salads, burgers and such on the menu. Eric was able to get a Philly cheese-steak in as close to Philly as we had ever been. They had etch a sketches for kids to play with... or for big kids. After lunch Eric and I met up with Keith and Megan to go to the college creamery on campus. It is the largest college creamery and is extremely popular judging by the line and volume they put out. Clemson makes ice cream and sells it on campus but it's nothing like this operation. There are about a dozen flavors to choose from. Eric and I had chocolate chip cookie dough, my favorite. We went back to the hotel to get ready for the wedding. 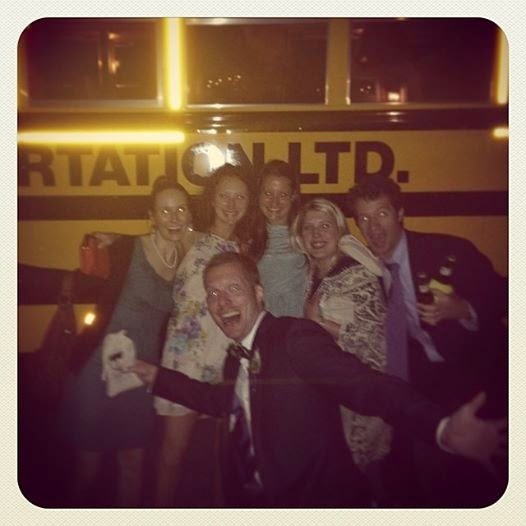 A yellow school bus was chartered to take everyone from the hotel to the farm about 25 minutes away where the wedding was. The ceremony was outside which was a tad tricky since it was very windy and a little chilly. At least it wasn't raining like it had originally called for! After the ceremony, they had appetizers and drinks in the bottom level of the restored barn while photos and such were going on. We took a few photos as well :) We got one of our whole group but it's on the groom's parents camera I believe. Of course Felix was the center of attention with his adorable bow tie and smiles. I was able to snag this photo of the bride and groom, Mary and Will look so happy and her dress is just gorgeous! Then everyone went upstairs to the top level of the restored barn for the buffet dinner, dancing and a photo booth. They served Penn State ice cream along with their cake... that's how popular this ice cream is around there. The yellow school bus took people back to the hotel in two trips, 10pm and 11pm. We caught the later trip back. The bag that a very excited Justin is holding is a bag a grits, the wedding favors. The next morning we drove back to Harrisburg with Keith and Megan so we could all catch our flights home. We did spot an Amish horse drawn buggy in a town on our drive... that was probably the highlight of the drive... like I said not very exciting driving through PA.
Eric and I hadn't been to a wedding for a year (Ross & Susan's was April 2013) which was the longest stretch without a wedding for us since we started dating in 2006 so we truly enjoyed the trip, especially the dancing. That's by far my favorite part of weddings! Congrats to Will and Mary! Anyone else think it's cool that both their names are sorta in the phrase Will You Marry Me? They totally should have played that up!